Linux Mint is another distribution that seems designed for new users, although many seasoned users find it as handy as anyone. Linux Mint takes Ubuntu and makes it usable by adding drivers and codecs and adjusting the default application stack for more mainstream appeal. In addition, they customize the appearance for a more universal demographic. Mint isn't just a revamped Ubuntu. Its developers actually write tools and utilities to increase user-friendliness. Best of all, it's one of the few distros that can truly be considered "install and go." All these factors are surely why Mint has soared into the top 3 of Distrowatch's Page Hit Rankings. The installer is a customized version of the Ubuntu Ubiquity installer which walks the user through a simple and easy installation. Mint also shares Ubuntu's Restricted Driver tool that will install proprietary firmware for certain hardware, such as video cards and wireless Ethernet chips. Many familiar GNOME elements are present as well such as the Control Center and panel applet browser. But what sets one distribution apart from the others is the original work, and Linux Mint has done theirs. The first thing one is likely to notice is Mint's unique menu. It's similar to SUSE's Slab menu by offering access to all entries from main interface. Favorites can be set up for easier access to some and computer mainstays are always present. Perhaps the best feature is the filter or search. Sure it will isolate the desired application from other entries, but if not present on the system the option to install will be offered. Mint comes with two distinct package managers. One is the widely used Synaptic front-end to APT set up with Mint and Ubuntu repositories, but the other is Mint's own. 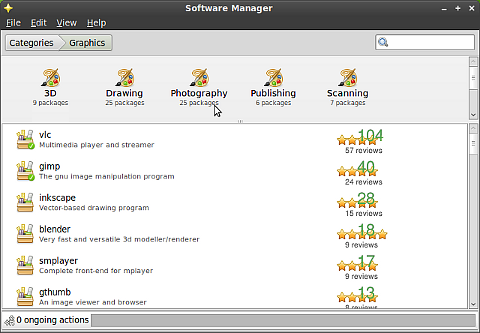 It sports a clean interface, easier to decipher categories, detailed descriptions with screenshots, and user ratings. If the application being explored is already installed, the action button becomes Remove. It's quite impressive in its simplicity. Mint has several smaller specialized tools too. One that might be of particular interest is mintBackup, which as it sounds is a backup and restore utility. Again, like the Software Manager, the interface is uncluttered and clean but includes handy features. mintUpdate is another. As its name implies, it lists and will update packages as security and bug fixes become available. In addition, it lists a safety level for each update corresponding to the level of testing done on Mint by developers. The update manager also comes with a panel applet that alerts the user of any available updates. The best thing about Linux Mint is its out of the box capabilities. Nothing says ease-of-use like having browser and multimedia plugins and codecs already included and ready to use. Nothing is appreciated more either, by a lot of users. There is a large community of friendly and helpful users surrounding the Mint project, so be sure to drop by the forums. This version comes with GNOME 2.30, but other desktop versions follow soon after initial release. Any way you look at it, Linux Mint is one of the best distributions available today from any project, no matter the size.